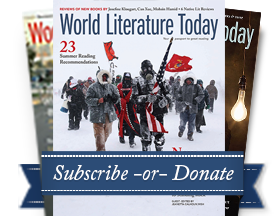 Latin American Literature Today (LALT) welcomes throughout the year submissions of translated texts (Spanish-English, Brazilian Portuguese-English) of contemporary Latin American prose, verse, interviews, essays, and book reviews. ALL translation submissions should follow the following guidelines. LENGTH OF SUBMISSIONS. Articles and interviews should have a maximum length of 2,000 to 2,200 words, unless otherwise directed by the editor; creative prose (fiction and non-fiction) should have a maximum length of 5000 words; poems should be limited to 3 to 5 poems; book reviews should have a maximum length of 1,200 words. FONT SIZE AND STYLE. All documents submitted to LALT should be typed in Times New Roman, 12-point font with 1.5 line spacing, in .doc or .docx format. Please do not submit in any other format. SPACING AND SPECIAL CHARACTERS: Please avoid extra spaces and/or special characters between paragraphs as much as possible. Do not add any space before or after a line of text, especially if it is the first or last line of a paragraph. DOCUMENT TITLES. Please place the article title at the top of the first page, then place your name on a separate line. TITLES OF ORIGINAL AND TRANSLATED WORKS: The title of a work that has previously been translated and published should be given in translation throughout, e.g., One Hundred Years of Solitude (translators are responsible for verifying whether a work has already been translated). The titles of works that have not been previously translated should be rendered first in the original then literally in sentence format in parentheses, e.g., No sé por qué (I don’t know why); thereafter, only the original title should be used. QUOTATIONS: Quotations from texts that have been previously translated, whether prose or verse, should be given in translation, e.g., “Many years later, as he faced the firing squad, Colonel Aureliano Buendía was to remember that distant afternoon when his father took him to discover ice.” Quotations from untranslated texts should be given in the original with English translations in parentheses, e.g., “Estos sabían mucho de todo pero nada de lo que importa” (They knew a lot about everything but nothing about what matters). CITING POEMS: If you cite two or more lines of a poem within the body of a text, please indicate the line breaks using the following annotation: “podemos hacer del mar/ sitio para la escritura” (we can make of the sea/a place for writing). For four or more lines, please use a block quote. RIGHTS: Translators must acquire rights to publish the original and the translation and must stipulate that these rights have been acquired in a cover letter. IMPORTANT: Submissions for any issue of LALT should not have been previously published. Simultaneous submissions are allowed as long as the translator withdraws the submission from LALT as soon as it is accepted elsewhere. Bios of both translator & author in English and Spanish of no more than 100 words. High-resolution photos of both translator and author. Statement of rights to reproduce both original and translated versions. Please do not send either PDFs of either texts or scanned photocopies of original texts. SUBMISSIONS (including the original text) may be sent to lalt@ou.edu. Please write “translation submission” in the subject field. All submissions of poetry and prose should include both the original and translation. The texts should be final versions. Please do not ask to make changes or revisions after submitting. Every effort will be made to acknowledge receipt of your submission in a timely fashion, but, given the high volume of inquiries that we receive, please allow a minimum of four weeks for evaluation and a response concerning acceptance. Once accepted, and before publication, we will provide a final proof for your approval. Please do not query after you have submitted your work. The editors of LALT reserve the right to accept or reject any work received and to make any editorial changes they deem necessary, not including changes to content. Once the text has been submitted, it cannot be modified by the author. We recommend that all LALT collaborators ensure they are submitting the final version of their collaboration to avoid editing problems after submission. For essays, interviews, and book reviews, please include your institutional affiliation (the university or research institute with which the author is associated) or city of residence at the end of the text, oriented to the document’s right margin in italics. COLLABORATION: We are also looking for Spanish-English translators who are willing to translate content submitted in Spanish. This may include essays, interviews, book reviews, and fiction and poetry. If you are interested in collaborating, please email lalt@ou.edu, and write “translation collaboration” in the subject field. OTHER INQUIRIES may be sent to the LALT editorial team at lalt@ou.edu. Please write “translation inquiry” in the subject field. Unless directed, please do not send queries or submissions to any other email account. Thank you for your interest in collaborating with Latin American Literature Today.